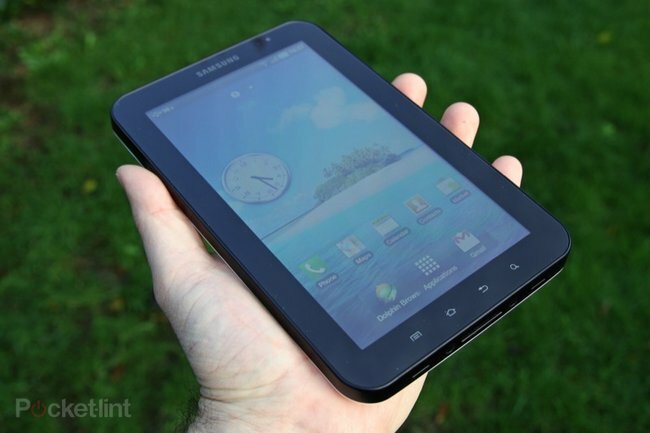 With key hardware specs ticking the right boxes, is the Samsung Galaxy Tab out of this world? We've been living with a retail version of the device, putting it through its paces. To see if it lives up to the hype, read on. Controls are typical for an Android device, offering four touch buttons across the bottom of the screen which light up when using them or the screen and offering the normal menu, home, back and search. Around the sides of the SamTab you'll find a volume rocker, standby/power key and that's all. 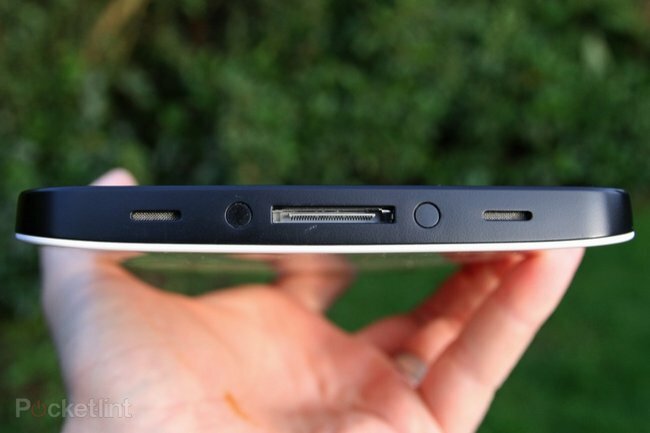 In terms of ports and connections, there are two covered slots on the right-hand side to accommodate SIM and microSD cards whilst the top sees the 3.5mm headphone jack. Charging and syncing takes place through a bespoke 30-pin dock connector on the bottom. It is a little inconvenient that there is no sign of a more typical Micro-USB, so you'll have to take an extra cable with you on the move - something that Apple users will have become accustomed to. The dock connector does mean that you'll be able to use it with a range of accessories, such as a keyboard or desk dock, which ultimately may progress the potential of the SamTab beyond that of just a big phone. The focal point will be the 7-inch capacitive touchscreen display however. Offering up a resolution of 1024 x 600 pixels, at 7 inches it has a pixel density of 169ppi. That's rather low when compared to smartphones, with smaller displays packing in pixels more densely to better resolve fine detail. Things don't look quite as crisp when you move from something like the Samsung Galaxy S at 226ppi or even the Dell Streak at 186ppi. However, the iPad, by comparison has a large 9.7-inch display, with a lower pixel density of 132, although the interface has been designed for it, so to a certain extent, the shoe fits better. ?It is, however, a higher resolution than most portable DVD players and the same resolution as almost all 10-inch netbooks. The aspect ratio lends itself better to movie watching than some of the larger, squarer, screens out there, but personal preference will play its part - less vertical lines to be letterboxed away in your movies means less lines of your favourite website that can be displayed. 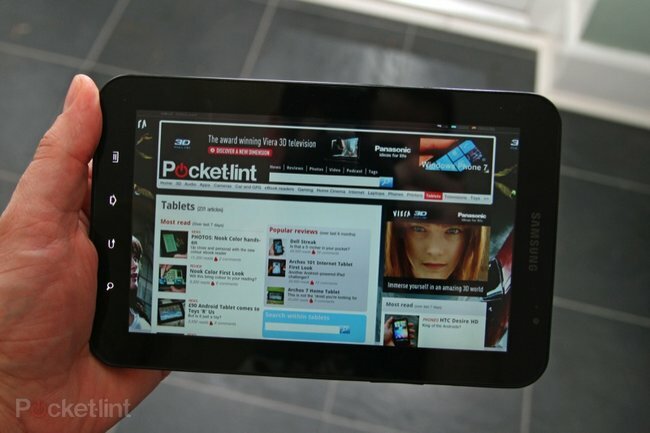 The display on the Samsung Galaxy Tab lacks the impact that the Galaxy S does by virtue of not being Super AMOLED. Viewing angles on the Tab are reasonable, with colour being maintained as you view from a slightly oblique angle - so it's good enough to lie it flat on its back and keep an eye on what is going on, something the software customisation by Samsung lends itself to. It is certainly bright enough and there is plenty of space available to be browsing the Internet or bashing out emails, although bear in mind that most Android apps you run on it will just be magnified, with very little designed to run on such a large screen. The glossy finish adds to the indoor or night-time wow factor, but those who want to use the Tab on the move will find reflections a problem, where fingerprints will show themselves horribly. The screen could have been a higher resolution - it doesn't get that HD tag for example - but it is good enough, and watching movies on it is an absolute joy, as is browsing the Internet.? 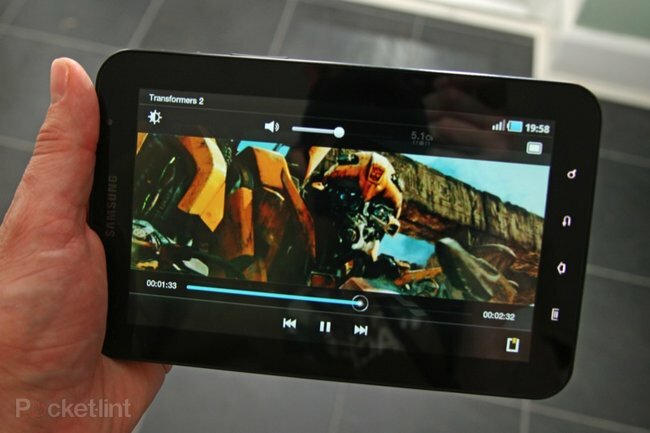 Power the Samsung Galaxy Tab on and you are greeted with the very welcoming Android 2.2. Bear in mind that some tablets are offering Android 1.6, and some don't come with the full Android Market - if you are an Android user, you'll be glad to find everything in its right place. 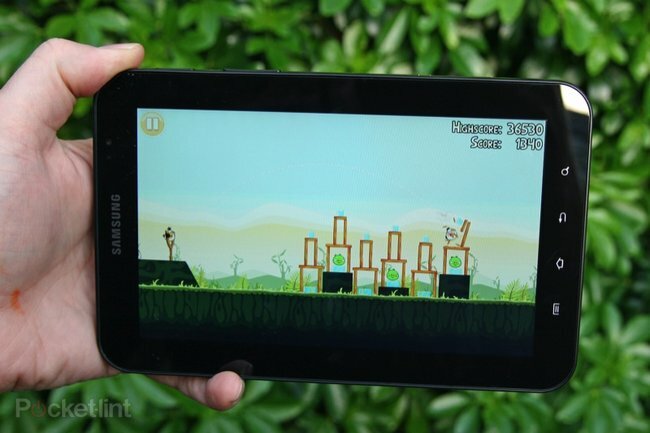 You can, if you wish, use the Samsung Galaxy Tab almost exactly as you would any other Android smartphone. Samsung hasn't heavily altered the user interface visually, but that hasn't stopped them tinkering under the hood, picking a few of the alterations its TouchWiz 3 has seen on the Samsung Galaxy S. The important thing you'll find about the Samsung Galaxy Tab is that the homescreen(s) auto rotate which most phones don't. If you want to lock the screen in landscape or portrait, there is a screen lock in the drop down status bar at the top - a useful addition - especially as Samsung has configured its core apps to run in both portrait and landscape. In terms of homescreens you can have up to nine, and this being Android you can basically do what you like with them. You can also cut down the number, so if you only want one or two, that's no problem. A pinch zoom action on the homescreen jumps out to a top-down view rather like HTC's Leap feature, so you can dive to the page you want straight away. On the bottom of the homescreen is a permanent floating dock offering access to the applications menu, with two shortcuts either side: these offer the browser and email by default, but a long press will let you swap them for any other shortcut you like. So you are free to add shortcuts, widgets and bookmarks to your heart's content, but Samsung hasn't stuffed it full of widgets - there is a useful task manager widget that will let you dive in and see what apps you have running and quit them, although the widget isn't really necessary, as a long press on the home button gives you a modified multi-tasking menu with access to the same task manager as the widget supports. Some of the changes we weren't so keen on at first. The contacts book has been altered to look like some sort of tabbed file system lying on a cheap office desk. Visually it looks worse than the default Android contacts system or the Galaxy S's contacts, but flip to to landscape and you'll find it makes much better use of the screen size. We love the fact that you have a dialler tab in your contacts, offering up nominated Favourites for you to contact. The calendar has had the same treatment too, offering tabbed views for easy access. We wish we could alter the visuals slightly, but Samsung's tinkering does make things a little easier to get to than the default Android apps. Running Android 2.2, it comes with all the features that version of Google's operating system boasts - that means things like simple syncing with your Google accounts, free Google Maps navigation, all the joys of the Android Market with those 100,000 apps. Yes, many are garbage, but the Android Market grows in strength every week and you'll find all your social networks are present and correct and much more besides. A big bonus is the full compatibility with Adobe Flash 10.1. That makes quite a difference when it comes to consuming content online as you can play all manner of videos in their place in the browser. On a mobile phone this is a nice feature, but for a tablet device, you're more likely to use it for more heavy-weight surfing from your sofa in lieu of using a laptop. In this case it works well enough for most sources of video, but it's not entirely infallible as you are at the mercy of the browser to get you to the site in the first place, and serve you the desktop site rather than the mobile site. We tried several browsers and found that sites like the BBC threw up complaints when we tried to access iPlayer in ?desktop? mode, and then offered lower resolution video through the mobile site (the BBC will let you download programmes in low resolution, though, which will do for some). iPlayer is an interesting quirk - if you opt to play ?full screen? from the off, it is very jerky, but just hit play and it starts smoothly, after which you can switch to full screen again. Of course, head over to something like The Escapist to catch up on a satirical Zero Punctuation game review and you'll have no problem viewing the videos, but overall, Flash support doesn't translate into a perfect experience just yet. YouTube is in place, naturally, with the Android YouTube player getting a refresh recently, but still lacking the stunning quality that Apple's mobile devices will offer you. That's not the fault of Samsung, however, it's an inherent Android issue.? Samsung's All Share is included, designed to connect you and your media around your home network, supporting DLNA. The app has been redesigned from the version you'll find on Samsung's mobile devices and unfortunately we couldn't get it to see any content, despite being able to see a number of different sources - a Mac running Orb, Windows PC and a home media server. So it looks like there is some sort of bug in this particular app - if you've got yourself a Tab feel free to leave us some feedback as to whether you've had All Share working or not. The default video player offers you a ?5.1? option and using headphones this noticeably widens the sound stage giving a more immersive experience, even from a pretty ropey video source. We also like the fact that you can switch off the auto brightness and set it how you want it, as well as cycle through zoom options (original, fullscreen cropped, fit to screen).? There is also a Music Hub and it is here where Samsung has its "iTunes" moment, offering up a neat selection of music from 7digital, which you can preview, add to lists and then eventually buy, with albums for ?7.99 and tracks for 99p. But this being Android there are obviously other routes to getting your music fix, be that through the AmazonMP3 app or via a service like Spotify.? We briefly mentioned the browser and this being a tablet you are likely to be spending a lot of time in the browser. The included Android browser has been tweaked slightly by Samsung, but still offers the same speedy navigation and multi-touch support. You get multiple tabs and slightly weirdly, there is a calling icon in the browser bar that takes you through to your contacts. You don't have to use the default browser of course and we picked up Dolphin Browser HD, added a load of extensions and got stuck into the serious business of surfing the web, the gestures and side menus working really well on a larger screen. Seeing as we've just mentioned calling, lets deal with the elephant in the corner. 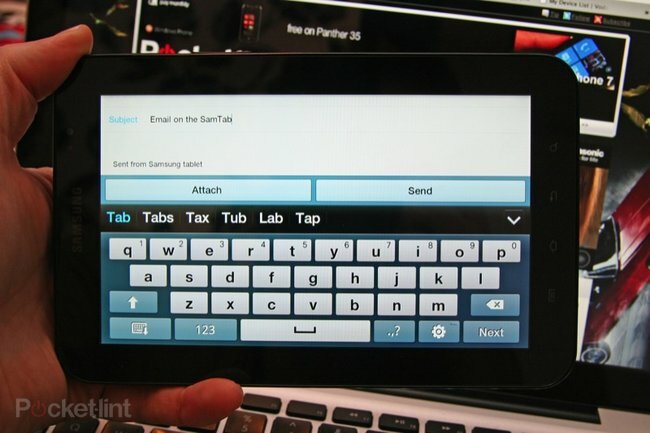 Yes, the Samsung Galaxy Tab is a phone, coming with full calling features. Samsung supplies a set of headphones with a mic so technically you could walk around using it and there is always the option of using a Bluetooth headset (the SamTab has Bluetooth 3.0). But seriously - seriously - is anyone going to use it as their primary phone? You can stick it in a jacket pocket, but the weight is sartorially disagreeable, pulling hideously at the cut of your bespoke Davies and Son suit jacket. Whether you actually use the SamTab to make calls will come down to your personal situation, but it does mean you can remain fully connected as you roam around thanks to the full 3G connectivity. Wi-Fi n is supported and being Android 2.2 you'll find the Wi-Fi access point feature in the Wi-Fi setting so you can use the Tab to connect your other Wi-Fi devices if you need to. 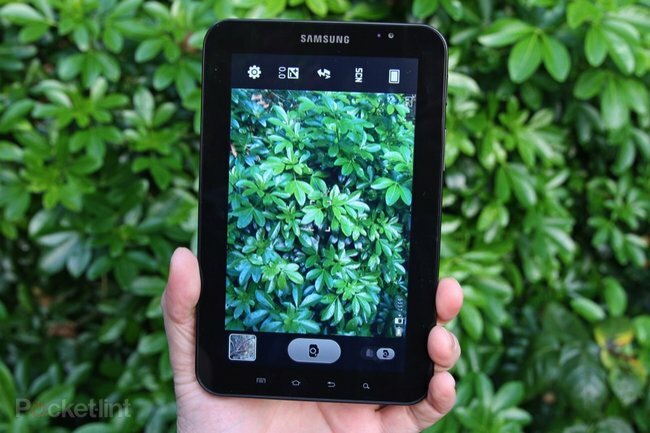 There are two cameras on the Samsung Galaxy Tab. A forward-facing camera offers 1.3 megapixels and can be rolled out for video calling (only between Tab owners at the moment) but who knows what this will bring in the future. On the rear is a 3-megapixel autofocus camera supported by an LED ?flash?. It's a convenient addition for snapping the occasional scene of interest, but the size makes it a fairly arduous task and the results aren't great by current camera phone standards, and the flash can leave a green cast on things. Video capture is offered, but only at a resolution of 720 x 480 pixels at 30fps. Again, it's a nice addition to have, but holding the Tab to capture that video is a little awkward and the fixed focus results fall behind what many current smartphones will give you. How does the experience compare to a high-end Android smartphone? Coming straight out of the review of the HTC Desire HD, we found that the touch response wasn't quite as good. It isn't as fast. and although it sports a processor also clocked at 1GHz, it only has 512MB of RAM compared to the Desire HD's 768MB and you'll notice that switching tasks isn't as punchy. That's a real shame, because if you own a high-end smartphone (like a Nexus One 2.2 or the Desire HD) you might always feel that the Samsung Galaxy Tab is a bit of a slouch. You're also going to be asked to part with a substantial wodge of cash for the Galaxy Tab. Amazon and Carphone Warehouse have it listed at ?529.99, but we're sure that those needing a new contract will find work-around deals that are more affordable than SIM-free. At ?529.99 it is the same price as the same spec Apple iPad, whilst Samsung will see its tablet undercut by any number of rival devices that might not offer the same tech spec, but might just do everything you want it to. Rumours of a Wi-Fi only SamTab are only just appearing, which might make you pause for thought - a price of ?429 if you want a little guesstimate from us. But the pricing against the iPad is important and that's a logical comparison. The iPad offers a larger screen which has both its pros and cons. Both offer a fantastic array of functionality. The iPad has the larger ecosystem with the App Store offering a healthy array of games that Android doesn't currently get access to. iTunes and iBooks take care of your music, movies and reading material, making a combination that's difficult to beat - unless you don't like Apple, which is a perfectly reasonable position to adopt. With content being the real king, you'll find a Samsung Games and Samsung Movies ?app? in place, both being links to Gameloft and Acetrax sites through the browser, with a couple of free games on offer. It might just be us, but Asphalt 5 isn't that exciting and we get the feeling that the real gaming gems will come through Marketplace - Angry Birds brings an obvious example. (We also found that every sound effect from Asphalt 5 found its way into the music listings, irritatingly.) If gaming comes together for Android or via Samsung's deals, then that changes the proposition slightly, but on launch day, it's not that different from any other Android device. You'll also find Samsung Apps in place, with two almost instantly dismissible offerings available to download.? Samsung's additions also include the Readers Hub of which there are three components: news, books and magazines. These are supported by PressDisplay, Kobo and Zinio respectively and at the time of reviewing, only the Kobo element was live. Kobo is a ebook retailer, but you'll also find an additional ebooks app in place (which supports non-DRM EPUB files), and the?announcement of a WH Smith deal has yet to show us the goods,?so things are already a little fragmented in the newly formed Samsung Galaxy Tab content world, and we're not convinced that there is anything to get wildly excited about in these offerings. The battery is a fairly hefty 4000mAh unit and isn't user replaceable. We're actually surprised how well the battery lasts. Having used a number of smartphones that eagerly piss away their battery in the course of a day we found that the SamTab would give us over 24 hours of occasional tinkering. Of course, the screen is a massive drain on the battery and once you start watching movies or playing games, this drops off hugely. Samsung says 7 hours of video watching and that's probably not too far off the mark. Needless to say, you'll need to keep close to power. For us, however, the Samsung Galaxy Tab is just too expensive and we can see that a large number of people would investigate the Tab and then settle on the more established convenience of the Apple iPad. We're yet to really get to grips with rival Android tablets to determine how low you can go in price before the experience is compromised, but we can't help feeling that the SamTab should be at least ?100 cheaper, if not more. We're happy with the screen, we love the video support (All Share failure notwithstanding) and the customisability - all appeal. At the same time, the Samsung Galaxy Tab will make you work to get the best out of it and we're yet to be convinced as to whether Samsung's content offerings hit the mark - we'll give Samsung the benefit of the doubt for now. There is also the lingering question of whether we'll see an upgrade to newer versions of Android as and when they appear, Samsung's track record around the Samsung Galaxy S suggesting you might see frustrating delays. But what you do get from the Samsung Galaxy Tab is a fully featured device and once you get the chance to settle down and load it with apps, and get things running how you want them, you'll find it a great companion. Slightly higher specs - more RAM - would have sweetened the deal, because unlike your mobile phone, you'll probably expect your tablet to have a longer shelf-life. Fingers crossed that prices fall then, because price seems to be the biggest barrier. The focal point will be the 7-inch capacitive touchscreen display however. Offering up a resolution of 1024 x 600 pixels, at 7 inches it has a pixel density of 169ppi. That’s rather low when compared to smartphones, with smaller displays packing in pixels more densely to better resolve fine detail. Things don’t look quite as crisp when you move from something like the Samsung Galaxy S at 226ppi or even the Dell Streak at 186ppi. However, the iPad, by comparison has a large 9.7-inch display, with a lower pixel density of 132, although the interface has been designed for it, so to a certain extent, the shoe fits better. ?It is, however, a higher resolution than most portable DVD players and the same resolution as almost all 10-inch netbooks. The aspect ratio lends itself better to movie watching than some of the larger, squarer, screens out there, but personal preference will play its part - less vertical lines to be letterboxed away in your movies means less lines of your favourite website that can be displayed. The glossy finish adds to the indoor or night-time wow factor, but those who want to use the Tab on the move will find reflections a problem, where fingerprints will show themselves horribly. The screen could have been a higher resolution - it doesn’t get that HD tag for example - but it is good enough, and watching movies on it is an absolute joy, as is browsing the Internet.? Of course, head over to something like The Escapist to catch up on a satirical Zero Punctuation game review and you’ll have no problem viewing the videos, but overall, Flash support doesn’t translate into a perfect experience just yet. YouTube is in place, naturally, with the Android YouTube player getting a refresh recently, but still lacking the stunning quality that Apple’s mobile devices will offer you. That’s not the fault of Samsung, however, it’s an inherent Android issue.? The default video player offers you a “5.1” option and using headphones this noticeably widens the sound stage giving a more immersive experience, even from a pretty ropey video source. We also like the fact that you can switch off the auto brightness and set it how you want it, as well as cycle through zoom options (original, fullscreen cropped, fit to screen).? You’re also going to be asked to part with a substantial wodge of cash for the Galaxy Tab. Amazon and Carphone Warehouse have it listed at ?529.99, but we’re sure that those needing a new contract will find work-around deals that are more affordable than SIM-free. At ?529.99 it is the same price as the same spec Apple iPad, whilst Samsung will see its tablet undercut by any number of rival devices that might not offer the same tech spec, but might just do everything you want it to. Rumours of a Wi-Fi only SamTab are only just appearing, which might make you pause for thought - a price of ?429 if you want a little guesstimate from us. With content being the real king, you’ll find a Samsung Games and Samsung Movies “app” in place, both being links to Gameloft and Acetrax sites through the browser, with a couple of free games on offer. It might just be us, but Asphalt 5 isn’t that exciting and we get the feeling that the real gaming gems will come through Marketplace - Angry Birds brings an obvious example. (We also found that every sound effect from Asphalt 5 found its way into the music listings, irritatingly.) If gaming comes together for Android or via Samsung's deals, then that changes the proposition slightly, but on launch day, it's not that different from any other Android device. You’ll also find Samsung Apps in place, with two almost instantly dismissible offerings available to download.? Samsung’s additions also include the Readers Hub of which there are three components: news, books and magazines. These are supported by PressDisplay, Kobo and Zinio respectively and at the time of reviewing, only the Kobo element was live. Kobo is a ebook retailer, but you’ll also find an additional ebooks app in place (which supports non-DRM EPUB files), and the?announcement of a WH Smith deal has yet to show us the goods,?so things are already a little fragmented in the newly formed Samsung Galaxy Tab content world, and we’re not convinced that there is anything to get wildly excited about in these offerings. For us, however, the Samsung Galaxy Tab is just too expensive and we can see that a large number of people would investigate the Tab and then settle on the more established convenience of the Apple iPad. We’re yet to really get to grips with rival Android tablets to determine how low you can go in price before the experience is compromised, but we can’t help feeling that the SamTab should be at least ?100 cheaper, if not more. Although the 2010 lineup of Archos Android slates has failed to impress, specially when compared to the likes of the iPad and Samsung Galaxy Tab, these models are about to get more appealing, by getting the update to Froyo. We have to remind you that Archos gives you quite a good bargain for their products, that are available with a very reasonable price tag. As far as the Android 2.2 rollout on the slates is concerned, you’ll get the update in the coming weeks. Charbax from ARMdevices.net has already had some fun with the Froyo build for Archos 70 and you can watch his experience in the video below. This is basically a walkthrough of the way the new OS behaves on the 7 inch tablet with $275 price tag. We’ve heard of smartphone customization, but what about some bling for your tablet? Samsung Galay Tab got customized with some precious Swarovski crystals, 5,700 to be more precise by CrystalRoc and Micro Anivka. The result is the device you can see below, covered in Swarovski Bright Crystals, all of them applied by hand. 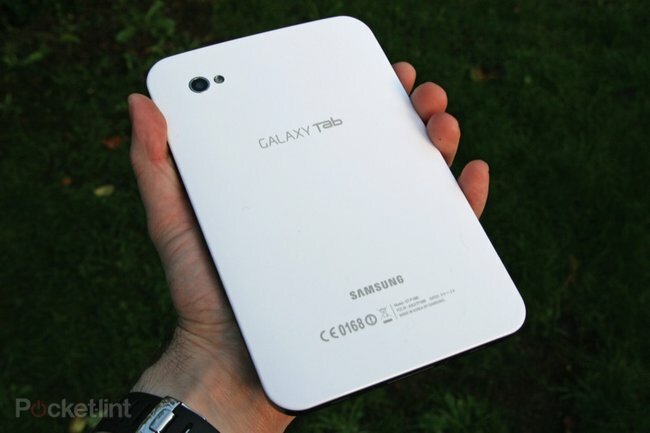 Crystalroc – Samsung Galaxy Tab from CrystalRoc on Vimeo. 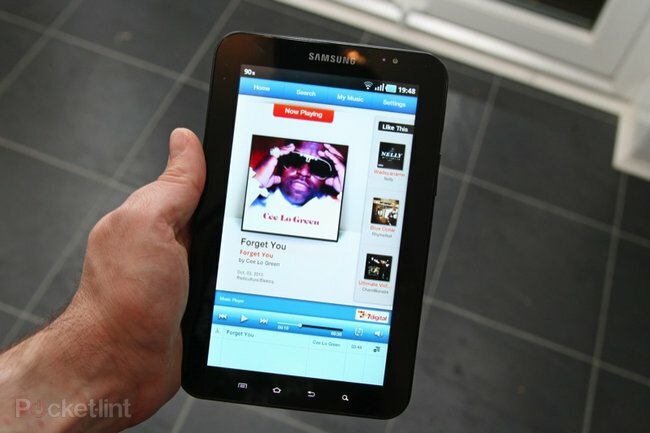 Samsung Galaxy Tablet to Debut on Vodafone UK? Since Walgreens sells the affordable Maylong M-150 slate, Toys ‘R’ Us also jumped in the biz, preparing another affordable tablet: the Elonex eTouch. It’ll retail for $144 and you’ll find two models available for purchase: a 7 inch one and a 10 inch slate, that costs $240. Nationite MIDnite Android 2.2 MID/Tablet Uses a Cortex A8 CPU, Goes Cheap? Chinese trade paper CENS.com recently quoted industry sources from China, specially representatives of Foxconn Technology and Compal Communications, who claim that they are working with Palm to produce a bunch of new devices. They come in all shapes and sizes and might even include the long-awaited PalmPad. Five devices will be made by Palm’s partner, Foxconn and one more by Compal, according to the same sources. They range from portrait and landscape sliders to keyboard-less slate-like handsets, a candybar phone and possibly something new and stunning. HP must make its influence felt in the joint venture with Palm, as the Pre 2 was considered a disappointment by the public. Let’s hope that the tablet doesn’t go the same way and the new smartphones have what it takes to succeed. 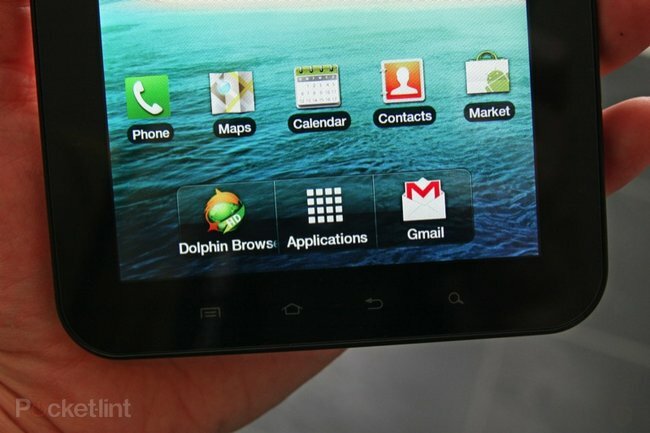 Palm and HP Already Working on webOS Tablet; Named Hurricane? 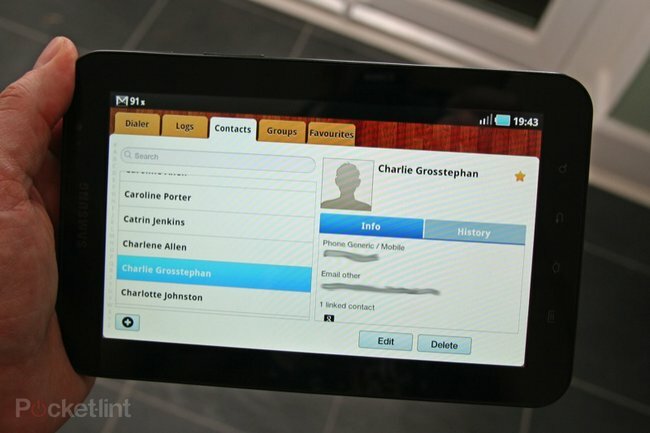 HP PalmPad/Hurricane WebOS Tablet Coming in 2011? ASUS may have kept away from the tablet fuss till now, but it seems they’re coming in full force and launching no less than 6 slates in 2011. The info comes from company president, Jerry Shen, who claims that starting from December 2010 we’ll see ASUS launching models in 7, 9, 10 and 12 inch form factors. The 12 inch slate will be based on Windows and an Intel chipset and it’ll hit the shops in January. Shen also claims that Microsoft was involved in the experience, enhancing the touch control and UI technologies on these new devices. Moving on, in March 2011, the company will launch a couple of 7 inch slates, one featuring WiFi and the other 3.5G connectivity. A pair of 9 inch units follows, one based on Tegra 2 and Android and the other a Wintel model. The price difference between the two will be $100. The 10 inch model wasn’t yet detailed, but we expect it to rock, since it would be considered an iPad rival. More info on this avalanche of ASUS slates at CES 2011! With launch day within touching distance there's been an interesting, if somewhat expected, twist in the Samsung Galaxy Tab saga. A Wi-Fi only model, GT-P1010, has shown up at the FCC and, with many people bemoaning the rather expensive price-tag of the 7-incher, it might throw a bit of a spanner in the works of the big launch as wannabe SamTab owners hold off for a cheaper option. The iPad is ?100 cheaper for the Wi-Fi only versions, and if the Galaxy Tab goes down the same road, it is a much more attractive prospect for people that had no plans to take the tablet out and about, or indeed use it as a massive phone. Rumours of a $499 price tag Stateside are doing the rounds, but as yet there's no whispers regarding a UK price. As ever, we'll keep our ears firmly to the ground to see what we can pick up, so be sure to check back on Pocket-lint for regular updates. iPad knock-offs aren't a new phenomenon. But a tablet that looks exactly like an iPad, and boasts Android 2.2? That's a whole new beast. And that's exactly what a Chinese manufacturer has come up with. With Froyo on board, this iPad clone boasts a 9.7-inch screen, and the same 1024 x 768 resolution as the real-deal. It falls down on the processor speed though with just 800MHz from its Freescale iMX515 chip (which is based on the ARM Cortex A8 architecture). This iPad imitator has 512MB of RAM, with 4GB of storage. With Android 2.2 running the show, it does trump Apple on the Flash front though - in that it can play it. There's no word on pricing or availability, but we can't see this hitting shops without Apple kicking up a fuss. Your best bet, if you really want one, is to keep a beady eye on eBay, or pop over to China. Verizon has just released its very own iPad version, starting at $629.99 for the 16GB version. You can get this device at any Verizon Wireless sore in the US, or via the VZ website and there are several bundles to choose from, so be careful when you shop. There’s the iPad bundle that includes the MiFi 2200 mobile hotspot, that will link the iPad to Verizon’s EVDO Rev A network. Well, this bundle can either come with the 16GB iPad mentioned above, or the 32GB one, for $729.99. There’s also a 64GB version, going for $829.99. MiFi 2200 requires a data plan, ranging from $20 per month for 1GB of data, to $80 for 10GB. You can also get the 3GB plan for $35 or the 5GB one for $50. The iPad alone, without the accessory and data plans goes for $499.99 for the 16GB version, $599.99 for the 32GB slate and $699.99 for the 64GB device. Verizon or AT&T to Carry the Apple Tablet?